I am amazed at how boring these scupts can be. Some of them are OK but overall there is a lack of spark and ambition in this work. Mayhaps Wyrd is boldly trying a new plastic material including a secret component. 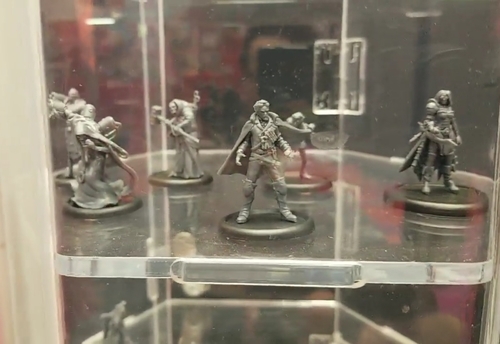 do we pictures of the minis of the new lady j crew? I really like the style of the new qi gong crew. Dont care they are static. There is a picture of Lady J herself, and it looks nothing like the image on the box. Different hair, different pose and different clothes. This means that either the box art does not match the models anymore, or the pictured model for Lady J was scrapped. Or that is an alt-model for someone, but yeah, it puzzled me too. I rather hope that this is the pictured Lady Justice because it is very Different, finally inspiring the troops in an active pose, instead of three in a row of posturing (and the GenCon ‘18 was again posturing). If we are going to get resculpts and alts they may as well change static ones to active and active poses to static. Hmm. I actually might like him. Need to see him in person I think. Curious to see the Undergrads closer too. If that is a new Anna, I do not like Her current model is more fun to me. Thanks for posting! I can't seem to find much coverage of GAMA on line anywhere. Or there are going to be two different models, one for Malifaux and one for TOS. Although I still think it's a bit uninteresting (especially compared to the master sculpts we've been spoiled with throughout M2e), the Albus model looks so much better than the art. Definitely agreed with that, I'm not amazed by it, far from it, but it's a very serviceable model which the art made me expect something much more meh. Though I do kind of have the same 40K comment I had for Cornelius, you tell me he is a radical inquisitor with his Adeptus mecanicos renegade acolites and I would believe you. I really like what I've seen here, which is a relief as the renders in monday previews had me very worried. Especially Agent 46. Here's hoping the art isn't accurate or it's been changed. Sure Basse can look like an inquisitor, but so can anything with a coat and a broad brimmed hat. A bit late - and a bit off M3E, but did they mention if the TOS stuff would continue to be PVC or revert to polystyrene? Thanks for your time (interesting pictures by the way). And finally, the Easter Sale as rumored will be held on April 21. If someone will attend the Adepticon it would be great if they could put the lists that are used in the tournament. Thanking you for your readings, I will wait until the release of M3E.